WC in Fields are leaders in portable toilet hire throughout Dumfries and Galloway, Ayrshire and Cumbria. We supply portable toilets for a wide range of events including music festivals, agricultural shows and outdoor private functions including wedding receptions. 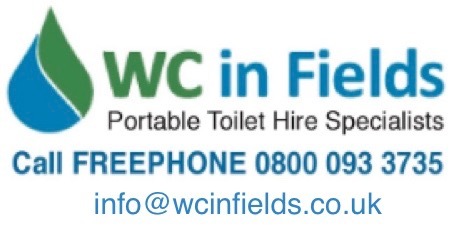 Whether you require a single portable toilet unit or a large number of units for bigger events, call WC in Fields today on FREEPHONE 0800 093 3735 or 01557 428 091 for more information, email us at info@wcinfields.co.uk or use the form on our Contact page. Portable self-contained toilets with cold water hand-washing facilities. These toilets are ideally suited to building sites, construction works or anywhere that requires self-contained toilet facilities. A regular weekly clean is included in the hire price. We remove and dispose of effluent, thoroughly clean the toilet unit, refill with fresh water, replenish soap, hand towels and toilet roll, leaving it clean, tidy and ready for use. Our toilets are provided with a vent pipe to ensure escape of any odours. Toilets also have a sealed tank so no effluent is visible to the user and the translucent roof allows ample daylight into the unit. Portable chemical toilets with RCD Protected 110V or 240V warm water hand wash. A fully equipped health and safety compliant unit with a regular weekly clean included in the hire price. We remove and dispose of effluent, thoroughly clean the toilet unit, refill with fresh water, replenish soap, hand towels and toilet roll, leaving it clean, tidy and ready for use. Our toilets are provided with a vent pipe to ensure escape of any odours. Toilets also have a sealed tank so no effluent is visible to the user and the translucent roof allows ample daylight into the unit. We can supply steel containers with several toilets and urinals for busier construction sites, with holding tanks or direct to mains sewer. We also provide water tanks and water, if required. We can supply fully self-contained welfare units in 12' x 8' steel cabins fully serviced with toilet, canteen and integral power generator for electrical appliances. Call WC in Fields today on FREEPHONE 0800 093 3735 or 01557 428091 for more information, email info@wcinfields.co.uk or complete the form on our Contact page, see below.